This flood occurred October 18, 1844. It was the most disastrous that has ever occurred since the city was founded. It came without warning, an avalanche of waters upon a sleeping community, many of whom were drowned and many of whom had narrow escapes from a similar fate. For several days before the occurrence of the flood a strong north-east wind had been driving the water up the lake, but on the evening of the 18th a sudden shift of the wind took place, and it blew from the opposite direction with a tremendous force never before or since known to the inhabitants of Buffalo. It brought with it immense volumes of water in a tremendous wave, which overflowed the lower districts of the city and vicinity, demolishing scores of buildings, and spreading ruin along the harbor front, playing havoc with shipping, and causing an awful destruction of human life. On Friday night last the city was visited by a most tremendous gale, which, for destruction of life and property has no parallel in this part of the country. The gale commenced blowing from the southwest about 12 o'clock (midnight) and in less than half an hour the whole lower part of the city south of the canal from Black Rock to the Hydraulics was submerged in water from two to eight feet in depth. On the east side of the city the water came as high as Seneca Street below Michigan and completely covered it. So rapid was the advance of the water that we are told by an individual residing on the other side of the creek, being awakened by the noise of the wind, and anticipating a rise in waters, hastily aroused his family, and before he could get his pantaloons on, the water was over three feet deep in the house. An individual who was on Main street near the bridge represents the water as coming up in one huge wave of about four feet in depth. Houses were blown down--unroofed--cellars flooded; in fact the great amount of damage done almost instantaneously. The loss of goods to our citizens must be immense, scarcely a dealer below the Main Street bridge, or that on Commercial St., escaped without loss. The loss of goods in forwarding houses was also very large. One house alone had over twenty five tons of dry goods in store, more or less damaged and groceries a total loss. The number of buildings utterly destroyed cannot be less than one hundred...some of them large and costly structures. The amount of grain and flour damaged or destroyed is difficult to ascertain, although it must be very large, as there was a great quantity of grain in store at this time. The height to which the water rose was altogether unprecedented. This may be accounted for the fact that for several days previous to the gale, a very stiff easterly wind had been blowing. This had driven the water up the lake, or at least lessened the volume escaping by the river. When the wind shifted to the Southwest, and blew with such fury, the water came down before it as if a dam had broken away. It rose twenty-two feet above the level which it stood Friday evening. 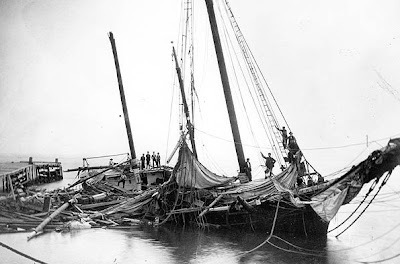 The damages and losses in steamboats and shipping is also great. 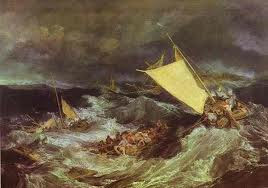 Much anxiety was felt Saturday for the fate of the steamboats, St. Louis, Fulton, Julia Palmer and the Indian Queen which left the evening previous and necessarily met the gale at it's heaviest point. 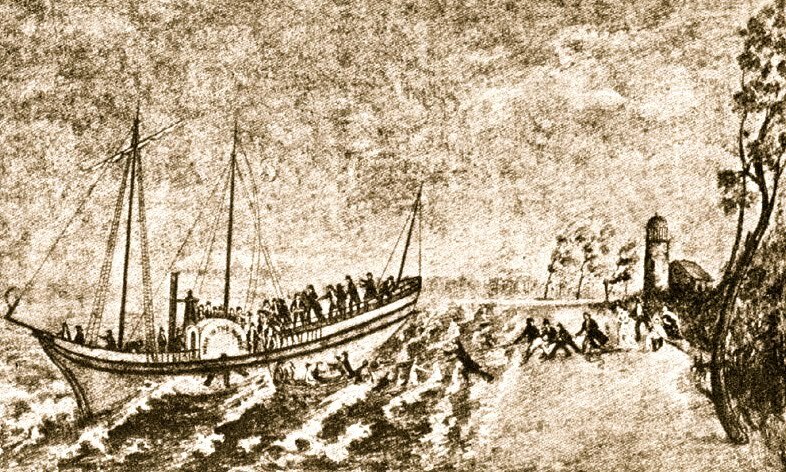 The Julia Palmer, with about 400 passengers on board, was driven helplessly down the lake into Buffalo bay about 6 o'clock Saturday morning, but when she was opposite the foot of Main street her anchors caught and held her fast, and there she rolled and pitched in a manner fearful to behold all the next day. A horse swam ashore from the Julia Palmer with a letter attached to its mane stating that they had burned all the wood and were "now burning the furniture". By Sunday morning at 8 o'clock the water had receded to a reasonable level, and she came in all hands safe. 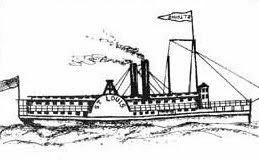 The steamboat Robert Fulton, after losing two or three passengers, who were washed overboard, was piled upon the sand beach above Sturgeon point, and will be a total loss; When the St. Louis was opposite Dunkirk she broke her shaft, and when paying out into the trough of the sea, four of her passengers were swept overboard and lost. 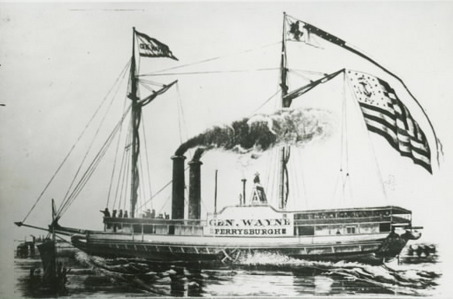 She was eventually blown into the Niagara River channel sideways at daybreak, and was rescued by a steam ferry boat and pulled her in to the foot of Ferry Street. The Indian Queen came in about half past 1 in safety. Goods on board considerably injured. Schooner Ashland beached near Erie street, got off. 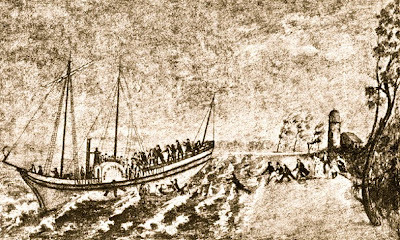 Steamer G. W. Dale was floated across Ohio street. Steamer Bunker Hill high and dry up the creek. Steamer Columbus driven into a pasture 200 feet from the creek. Brig Europe reached Buffalo damaged in her hull and outfit. Steamer Chautauque is ashore on her beam's end near Black Rock. Schr. J.F. Porter is on her side at the dock near Wilson's Coal Yard. The Commodore Perry came in about 12 o'clock friday night in a most shattered condition, her wheelhouse being smashed in--and the boat almost a cripple--in coming in she ran into the Great Western, after which she ran her bowspirit through the side of the Wayne, where she remained fastened. Upwards of eighty canal boats went ashore between Buffalo and Black Rock. 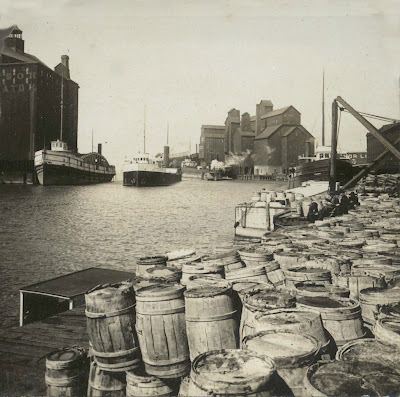 In the lower districts there were many harbor craft and canal boats left by the receding waters, many canal boats being out on the commons, on Division, Eagle and Clinton streets. South Buffalo was strewn with miscellaneous wreckage of all kinds. It is safe to say that upwards of two hundred small buildings in the lower part of the city have been entirely destroyed. There is scarcely a house in it's original position on the other side of the Creek. At the corner of Main and Ohio streets the water was six feet deep and at Michigan and Exchange streets it was five feet deep. The sea wall and stone pier of the harbor have been also very seriously damaged--extensive breeches have been made in the breakwater extending from the lighthouse--and large stones many tons in weight, have been carried from ten to twenty feet from their original position. The track of the Attica Buffalo railroad for a mile and a half was washed up so that the cars had to leave the Hydraulics in the afternoon--the woods on the line of the road were leveled with the ground. The most appalling part of the calamity is the loss of life. It is impossible to get at any thing like accuracy in our estimate. The number brought up to the court house for inquest was twenty-nine--these; with one killed and two(Mr. Havens and his boy) not taken to the courthouse make 32; to them may be added three lost on the Robert Fulton and four on the St. Louis, make 39 in all, besides several who are missing. It is impossible to speak with any certainty of the number of lives lost. Ed. The papers gave a long list of people of when, where and how they were found, which I shall not repeat here.... Needless to say the suddenness of the storm and the wave of water filled up basements and first floors in a matter of minutes and in some cases, seconds, leaving no chance of escape for sleeping tenants. At Huff's hotel, at the corner of Main and Scott streets, the water was six feet deep! Many were just swept into the Lake. The office of Messrs. Bidwell and Banta made a similar voyage across the Big Buffalo Creek, bringing a valuable though less precious cargo; viz, their iron safe. It was brought safely over the creek and dropped on the flats between Ohio and Elk Streets; the office thus lightened of its burden, continuing it's voyage to the Hydraulics or that vicinity. The reports continued in the papers of ships sunk or damaged, harbors ripped apart and lives lost up and down Lake Erie; Cleveland, Ashtabula, Dunkirk, Erie Pa. and many others, with debris of all sorts turning up on the beaches. "We are informed of barrel heads are coming ashore at Cattaraugus Creek" also "a white eagle supposed to be from the stern of the Schr. Pennsylvania, Capt. Barnard, have been picked up at the same place." Parts of a fore-scuttle with "Pennsylvania" in red chalk, and some broken deck planks and bulwarks" hinted at tragedies not yet discovered. According to later records 40 years hence, "At Buffalo the loss of life and property was greater than all other ports combined. 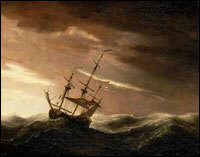 The number of lives lost at Buffalo were fifty-three and those on the lake twenty-five, and eighty-eight in all." The Common Council set a meeting Saturday afternoon, for the purpose of devising measures for relief of sufferers of the gale. The sum of $400 was placed at their disposal. They prepared a place of resort in the basement of the Mohawk Market where the distressed and destitute found food and a temporary asylum. The Mayor appointed twenty-five additional watchmen to protect the properties of the sufferers. A call then went out for food, and clothing especially, because most left their homes with nothing but their night clothing on and lost everything else. "The charitable would render effectual assistance by sending old clothing of any kind to the Mohawk Market, where it will be judiciously dispensed by the committee." As always, Buffalo citizens responded generously as they still do today. *Editors Note: The storm illustrations above were not from the storm mentioned in this story. They are there for illustrative purposes only. There are no known illustrations of the incident in 1844. Also the proper term for what happened is a "seiche"(pronounced saysh). Unlike a tsunami, which is caused by submarine earthquakes shifting the ocean floor, coastal landslides, or a meteor striking the ocean, a seiche is caused by air pressure and wind. It can have the same effects as a tsunami but is slower moving. If you get hit with one by surprise, I am sure you don't care what it is called! It's still a wall of water and your no better off either way! In the late 60's we had a similar weather pattern and the lake rise was about 10.5 feet. At time it was equal to the record rise. 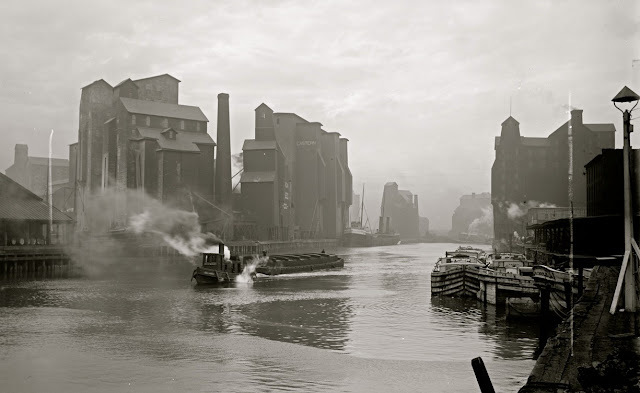 I was on the Derrickboat McCauley and we moored at the Genesee slip away from the warehouses. We raised the spuds and ran lines for an aft as long as wwe could make them to allow the boat to ride easily. We dropped 12X12 timbers into the space between the boat and the concrete fae of the dock, It got ground and shredded to pulp in a couple of hours. We used 3 inch nylon towing line to moor botht eh McCauley and te Tug Nash and during the night I had to wrap some parts to slow the chaffing that threatened to sever them. The winds and the wate were so intently threatening I stayed over and worked straight through the night. The two night watch people threatened to go home if I didn't stay with them. But I admit I was pretty edgy through the whole process too. Actually, a tsunami is a seismic sea wave and is earthquake-generated. A seiche is the proper term for 1844's event. In the last paragraph of the story under EDITORS NOTE I had already stated that distinction. Seiche! just wouldn't work in the title because few people know what that term is. That is why I explained the difference later. I will highlight that paragraph though to make sure it is read. Thank you for your comment. wasn't there a seiche in December '85 that flooded some of the ward? not as extreme and wth no loss of life, but for some reason that's stuck in my head. . . I was living and working at my parents business, The Harbor Inn at the time on Ohio St. Seem to remember the banks of the Buffalo River overflowing down the street. We were just high enough where the water was inches from coming over but we lucked out. It was nerve wrecking seeing the water at the nearly the same level as the street. Down by the Ohio Street Bridge the water came over the banks and flooded the streets. Could have been in 1985, sounds about right. We were hit by the 1985 seiche in Port Colborne Ontario, 12 miles from Buffalo NY. My lakeshore property lost 70 feet of lawn to the lake and destruction of my seawall. The water level of Lake Erie was very high because of prolonged rains earlier in the season. I suspect that the seiche of 1844 destroyed our last lock in the Welland Canal near Lake Erie. Shipping was transferred through other routes for 5 years until the lock was rebuilt. What kind of conditions are you seeing this evening 11/12/2015?